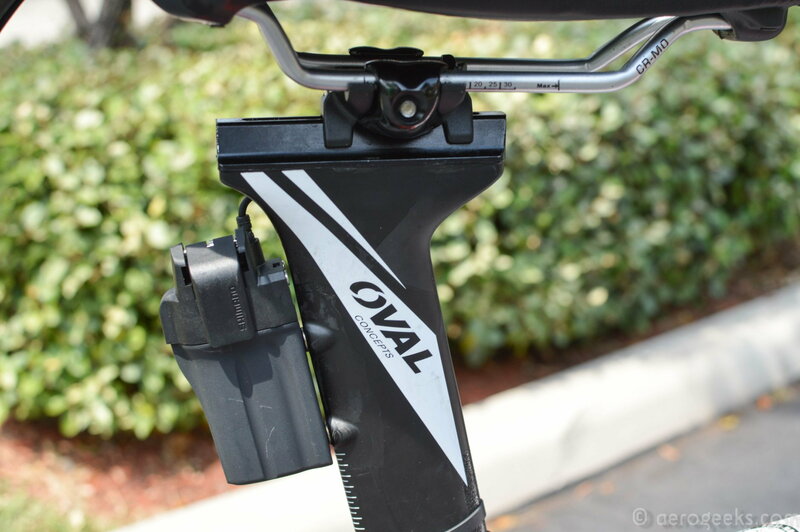 For riders that are 190 cm tall or taller, the horizontal distance between the vertical lines passing through the bottom bracket axle and the extremity of the handlebar extensions including all accessories may be extended to 85 cm. I think the pad angle is now 15deg, could be wrong though. We've got a workshop in a few weeks time with Dan from the Huub team, I'm hoping to check out the regs as he'll know them inside out. 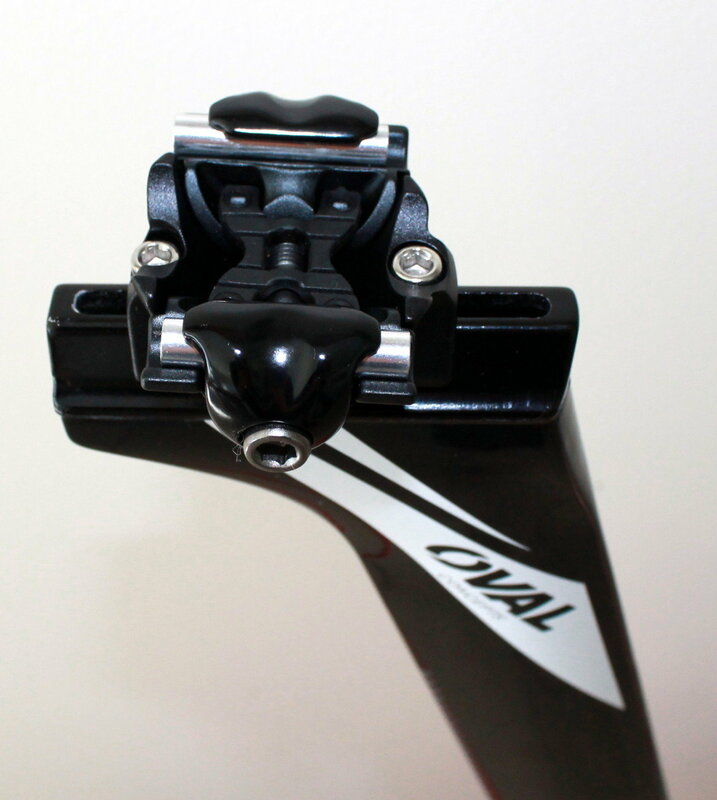 BTW, someone recently has said to me that if your saddle is more than 5cm behind the BB you then gain that amount on the 75cm from BB to bar ends, not sure about that though. Solid advice. I remember @carleton also mentioning specifically to get the most senior com to check over the bike apart from the official checks and get them to sign off/agree your setup. It's all well and good to be the best kind of correct: technically, but if the rule implementers don't agree you're up against it. Going back to the bag discussion, I tried a Zoot Triathlon bag last year. It was great for carrying a lot of stuff, but in practicality, it wasn't great for the track. The way it opened was kind of a clam shell design, so it took up a lot of space at the track - I guess tri people like things all spread out. I ended up selling it and getting an Ogio Endurance 9.0, which is a duffel with backpack straps. I like it a lot. Thanks Dalai! I see a bunch of guys with that setup at T-Town. It does work, but not what I'm looking for. If you get there after the gate closes, there are lots of steps to get over the bridge. A cart is kind of cumbersome on the stairs. Thanks topflightpro! I'll give the Ogio bag a look. I used a Camelbak military spec backpack. I took out the water bladder. I would load it with the track sack (with chainrings and cogs and small parts), then tools, clothes, shoes, numbers, pins, pens, snacks, water bottles, etc... would go into the rest of the bag. I would clip 1 or 2 helmets to the outside of the bag using D-rings. Then I'd hike it on to my shoulders and my hands would be free to walk/carry the bike. Last edited by carleton; 03-12-19 at 02:26 PM. Fair enough. My local indoor has an elevator on the outfield side but only steps on the infield side of the tunnel and agree steps are a pain. But it is only one set in and out so preferred this to the multiple trips to the carpark; which could a long walk if other events were on as it is part of a multiple sport complex. Plus avoided the sore arms carrying the rollers and other gear. Will look into Carletons suggested bag though, sounds interesting! I'll add my wife has the smaller Ogio Endurance 7.0. Both bags have external helmet strap systems, which are nice. But the 9.0 is large enough I can fit shoes, clothes, track sack, towel and helmet inside the main compartment. The helmet strap would let me bring two helmets - regular and aero. It also has two external pockets for bottles (7.0 has one). There are also plenty of pockets on the side and an expandable area for storing a wet suit - would probably work for a track sack as well. Lots of good options here, thanks guys! Anyone have any links to any cheap and decent track gear bags. I like the look of the bls ones but they seem overly expensive. Just after something for cogs, chainrings and tools, I already have a bag I've used for years but it's getting a bit old. Laptop bag - one made for the older larger laptops. Mine cost me $15 and I have too much room, thus allowing me to carry much more than I'll probably ever need I purchased based on recommendation from a friend and best move ever. Cheap as hell and had room for my 60t that no gear bags at the time catered for. I use cardboard pockets to separate the chainrings so they don't scratch up on each other. Can carry it in the hand or they come with a shoulder strap for more carry options. Another +1 for the Ogio bags. My bag is pretty much the equivalent of Dalai's system, but the handle and wheels are contained in the bag. Motocross gear bags are well suited to what we need. They can be large enough to take everything we need, they're often compartmentalised to separate various bits, and a lot of them come with handles and wheels to aid transport. If I spent more time at tracks where I had to carry my gear though, I'd invest in one of those little trolleys that have been posted about before and just carry everything including the bike in one go. One more for you - last year I started using my High Sierra ski boot backpack as a temporary track bag. Its just a big square-ish backpack, no fancy compartments, just a couple of pockets. It is just the right size for my tools/shoes/helmet/gear and I have been using it ever since. Amazon has hundreds of boot backpacks from about $40 - might be worth a look. 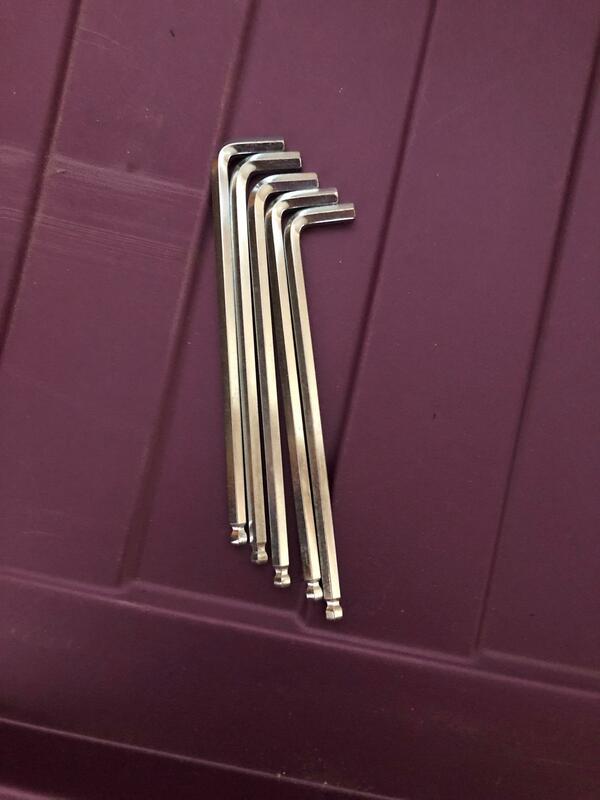 I bought some chairs from IKEA and in each one they included a 5mm ball-head allen wrench...the kind that are perfect for removing chainring bolts. So, if you are ever in IKEA, there is an area, usually near the Merchandise Returns area, where small parts bins are located with all of the weird IKEA tools, screws, nuts, bolts, etc... free of charge (I think). These allen wrenches should be over there. It's always nice to have one or two extra in case someone borrows yours in the infield and doesn't return it. Or one for the track sack and one for the toolbox. For those who aren't familiar, the ball-head end is especially nice. It allows one to vary the angle slightly and still maintain contact. This makes for easy spinning of the chainring bolts on and off with the fingers. Sorry if I missed this if already posted, but are Stone chainrings crap quality, or good? I'm looking for a good, affordable, round, stiff big ring or two (58 and 60t). Thank you for insights as always. How could I get a Fuji Norcom seatpost? Had written to all email addresses available at internet related with Fuji, Fuji dist., Oval, etc., without success. It's related with track because I use the wonderful Fuji Track Elite frame, but its seatpost is too far back and the one-screw system doesn't hold the seat level, when you get the extra "g" on track banks. The Norcom have same system/profile but it's much more advanced and will not suffer from the high moment that is moving my seat.. I'm not sure what you are asking exactly? Fuji won't answer your emails (they never have mine) you will have to find a brick and mortar dealer and go through them if you want a seatpost or any other parts. The toppers are Ritchey WCS Alloy 1-bolt . It's the same on the track elite and the Norcom. I think he's asking if we know of any other way to get this seatpost outside of what he's done so far. If I recall, he lives in South America (Brazil? ), so finding a brick and mortar Fuji dealing shop might not be easy. RA Cycles in NYC is a major bike shop. They can get just about anything. If you can work something out with them, maybe they can get you the post and ship it to you. I bought my first TK1 from them and they got me an upgraded seatpost soon after. They also tried to get me a seatpost for my LOOK 496 but were not able...but they tried. ahh gotcha, that makes sense. Another option (failing contacting somewhere like RA) would be using a middle man from someone/where with access to a brick/mortar. It's pretty annoying to have a brand like Fuji that sells a lot of bikes online not be willing to talk to the consumer directly about small parts. I tried to buy some of the Norcom stems (matches the Track Elite's lines nicely) a year or so ago but also got the cold shoulder. Eventually just bought some used through forums. What happened to Shane Perkins at Worlds? He was rostered for TS, but it seems that he didn't ride even once. How is his moving to RUS working out in general? I asked this a couple of weeks ago. Seems unclear, but maybe he just missed qualification? Or was an alternate? In any case, he's here now doing pro keirin and actually earning some Y.
I found it really strange at the time, because he was hyping it up and mentioning looking forward to his involvement. Then the week of the competition he went radio silent. Agree. I was also pretty surprised. Weird backroom maneuvering at the Russian team? Seems a real shame as he obviously went through a lot to change nationalities only to be left home.